This energetic and delightful couple were the lucky winners of a competition that we ran for our first expo, we were in for a treat when we pulled their names out of our hat (well it was a bowl, but hat sounds a little more magical). Right from the start they were cool, calm and collected. Annie was probably more fuss free than any other bride we had ever met. We absolutely loved the fact that she didn’t get lost in additional details, she knew she was marrying her best friend in front of her loved ones and that was the only important thing to them. During one of our meetings over sangria (coolest couple!) discussing their wedding plans and their concerns leading up to the day. I think we talked more about them as a couple and their honeymoon plans, 3 weeks in gorgeous Hawaii! After a jug of sangria, we were pretty sure we convinced them to pack us in their bags! We arrived at Maleny early that Friday morning and you couldn’t have asked for bluer skies, it was such a beautiful drive up the countryside. Annie, her family and her bridesmaids were staying at The Shieling, a beautiful country house overlooking the luscious green hills. It was the perfect picturesque place for everyone to relax the night before the big day, it also called for great images whilst everyone was getting ready! 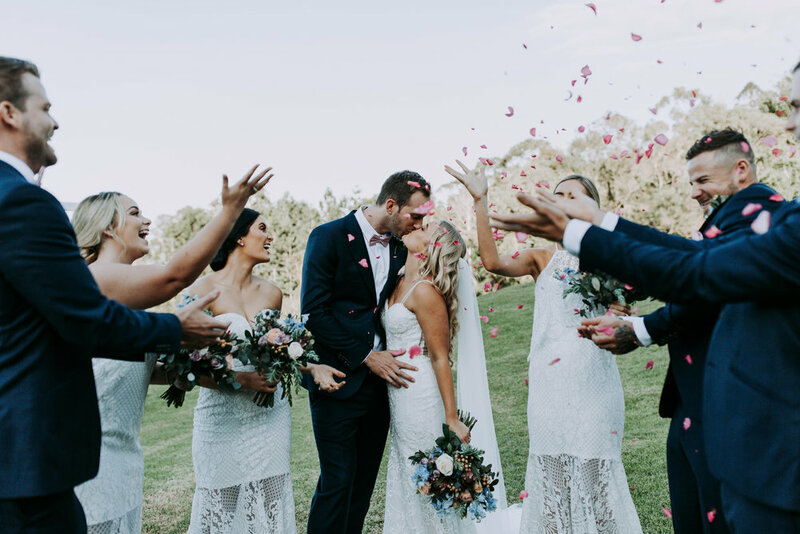 They booked the beautiful Maleny Manor, which is stunning on its own right, seriously check them out! The venue is located on luscious acreage with their own chapel, accommodation and photo spots. It was honestly beautiful. The ceremony was set with hanging flowers overlooking the gorgeous hinterland view followed by jars of flowers down the aisle. Inside there were mismatch jars of bright flowers on the tables, wooden name place cards and a doughnut wall. Yup a doughnut wall – try watching that being set up when you forget to eat lunch! The ceremony was beautiful, we still can’t get over the image of Dan’s reaction seeing Annie walking down the aisle for the first time, gives us butterflies! Oh that and the first kiss! There was so much love in that little chapel and it was rather infectious! I think our favorite part of a wedding is always the speeches, we love hearing about their old stories, how couples had met and how their loved ones speak so highly of them on their special night. Annie & Dan's speeches had all of that and more! They were filled with laughter, lots of laughter! All their funny stories about who they were and what they got up to when they were younger had the whole room in stitches. We loved the way Annie would cheekily smile at Dan as if to say "Yup, that's my Dan!". There was also a lot of love in the room. Cutting of the cake followed by one swift move from Dan onto the dance floor which was magical. The dance floor had officially opened for the night and the bridal party and guest made no time like the present to dance the night away! PS. Don't you just love their wedding cake?! Annie and her bridesmaids made it themselves and it looked and tasted amazing, hows that for a practical bride and also a pretty fun activity to do with your girls! To top it off Annie & Dan chose some awesome suppliers to be involved in their wedding day! Who supplied the magic on day? They had a troop of fantastic suppliers to capture, film and make their day even more fun! Thanks guys for being great to work with. Wedding cake: Brides own creation! Thank you so much Annie & Dan for letting us in on your special day, we honestly had a great day and loved all of the fun and the emotions! We wish you all the happiness in the world and cannot wait to catch up again with more sangria! Follow us to see all the things we get up to at other people's weddings!